Increase your mobility with the MX applications! 3 MX applications for your tablet. Get a quote in a couple of clicks! Application that allows you to configure MX products based on the tractor to be equipped and to get the retail price in a couple of clicks. The contents of MXConfig are updated continuously. Restricted access solution available for PC and tablet, online and offline. MXPower shows all the technical features of MX loaders in a simple and easy way. You can also compare MX loaders to each other and, via secure access, to the loaders from competitor brands. 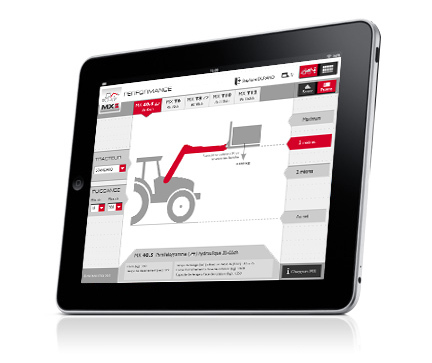 MXBalance enables you to accurately calculate the counterweight needed for your tractor. Ballasted with the correct weight, the tractor will not slip, tyre wear is reduced and fuel consumption drops. > MXPower shows all the technical features of MX loaders in a playful and ergonomic way. > You can also compare MX loaders to each other and, via secure access, to competitor loaders.